Yesterday as I was coming home from work I was wondering what material I had laying around that could be turned into a post for today. As I crossed the bridge into town I looked to my right and saw a locomotive that had derailed and instantly knew that an answer had been provided. In the world of derailments this one car slip up doesn’t seem to be that big of a deal. 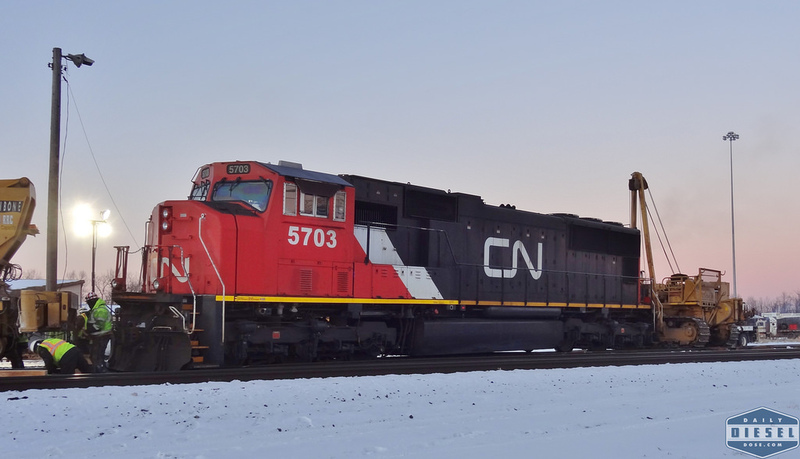 Canadian National train 5703 was just ever so slightly misaligned but when dealing with tons upon tons of cold steel details count. It’s possible before I arrived there was at least one other locomotive involved and maybe a few rail cars. Sadly I only had a few moments to spend on the scene and that is a crying shame as visual access to the site was superb. Two massive side lift bulldozers where on hand to help right the train. As you see can one was already attached to the rear of the train while another (not shown) idled near by. 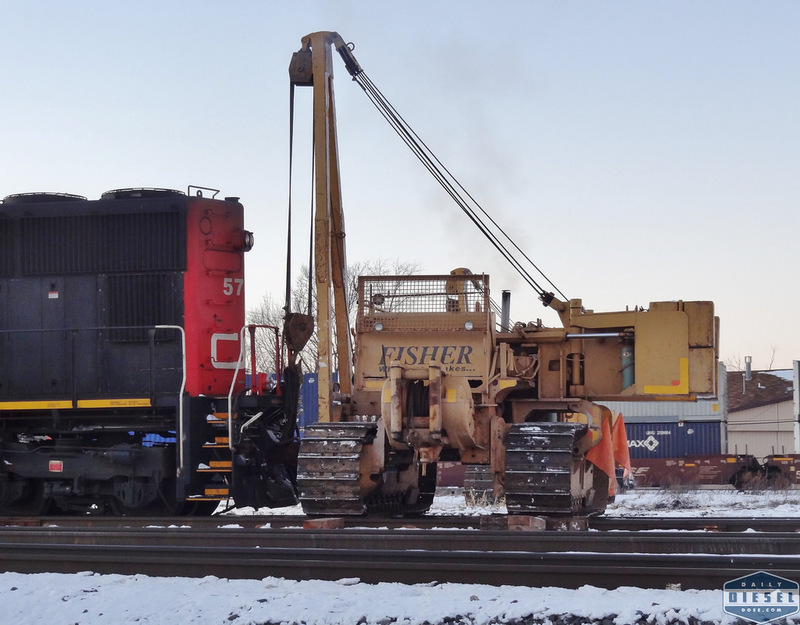 Toward the front, a 110 ton capacity Pettibone crane was setting up to to lift 5703 back onto the track. There was no mistaking the power plant of this crane. Detroit Diesel all the way. Even the simple act of setting the outriggers caused a full power scream that carried through the cold air and could be heard all over town. There was an veritable army of CSX trucks and workers on scene plus two large flatbeds used to carry the dozers and other equipment of the Fisher Companies. If you take a a moment to check out their website you’ll see a shot of the Pettibone doing a lift identical to the one that took place last night. Five hours later I was able to stop by the accident scene once again and found all the heavy equipment long gone while the CSX crews were still hard at work repairing the damage that probably caused the derailment in the first place. Oh, and thanks to rrpicturearchives.net we now know that CN5703 is a 1996 EMD SD751. This entry was posted in Heavy Equipment and tagged canadian national, cn rail, fisher companies, pettibone crane, train derailment. Bookmark the permalink. The dozers in the trade are called “Sidewinders”. Their main propose is pipeline pipe layers. The other companies in rerailing are R J Corman and Hulcher Services. Thank for being the eyes of us heavy equipment followers. You’re welcome. I only wish I could have stayed longer. 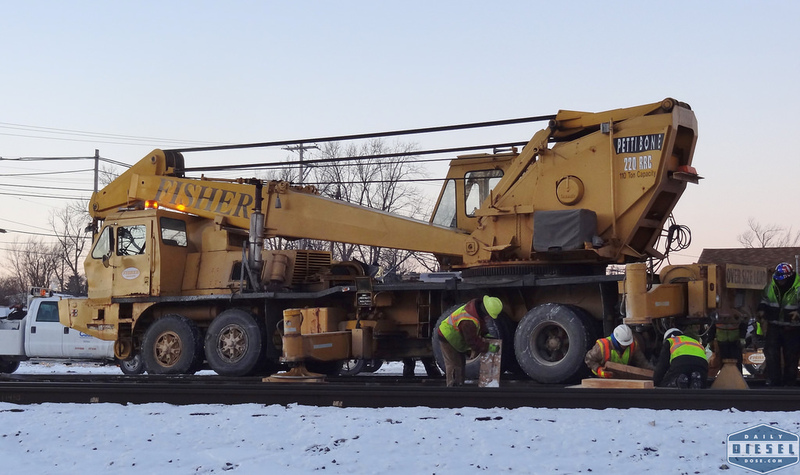 FISHER COMPANIES IS PROUD TO HAVE BEEN PROVIDING THIS SERVICE FOR 47 YEARS TO ALL RAILROAD COMPANIES AND INDUSTRIES . Jack, you created a great local company. I’ve enjoyed seeing your crews at work outside of the Hotel Syracuse these past few months.